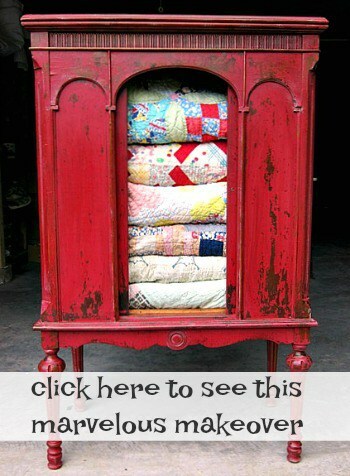 I have a bunch of tips for distressing painted furniture and other painted items. I don’t pretend to know everything about the subject but I’ve learned a few things after working on hundreds of paint projects. Mostly I learned by making mistakes and by trial and error. If even one of these tips helps you …..I’ll be happy. Paint type makes a big difference when it comes time to distress the paint. Most brands of latex paint sand off easily….even the type with paint and primer in one. Spray paint is also easy to distress because the paint layer is really thin. Chalk paint, Caromal Colours, Beyond Paint and other specialty furniture paints adhere to furniture really well and take a little more elbow grease to remove. 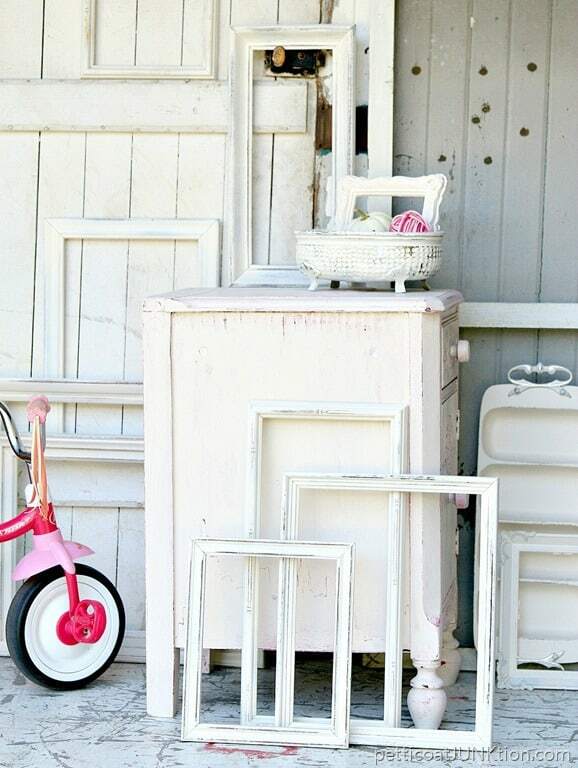 Some types of furniture just can’t be distressed. Furniture made out of particle board, MDF, and similar products other than wood should not be distressed. Once you sand through the paint and the top coat, it is like paper or pulp chips. Furniture can also have drawer fronts made of plastic, really. These cannot be distressed either. Real wood is the only product that can be distressed properly. If you do have MDF or fake wood look furniture I have a great technique for making the paint look distressed. 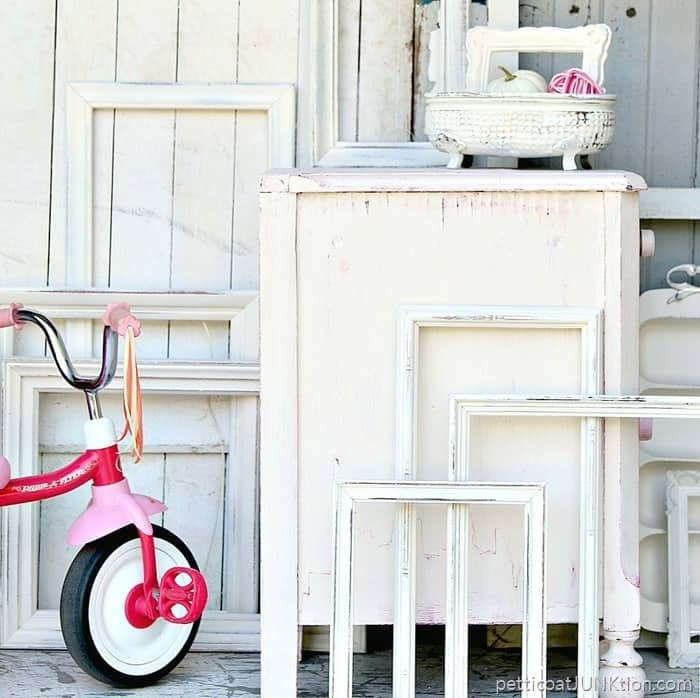 You can find that post here…How To Give Painted MDF Furniture A Distressed Look. Sandpaper is rated according to grit or coarseness of the particles used to make the paper. Sandpaper comes in grit sizes from P12 to P6000. The smaller the number the coarser the grit. For distressing my DIY projects I use a grit range between 60 and 220. Sixty grit is very coarse and I use it to remove well adhered paint. A good standard for furniture projects is 100 grit. I also love the flexible sandpaper made by 3M especially when distressing the paint by hand. I fold the sandpaper so there are 2 or 3 layers in order to grip it better. You can fold the other sandpaper but it will come apart when using it. 4. How long the Item has been painted. Freshly painted projects will distress easily, usually. If a piece has been painted months or years it will be much harder to remove the paint. Distressing paint with an electric sander or by hand is a matter of preference. You have more control over the distressing when sanding by hand. The power sander will remove a lot of paint in very short amount of time. If I’m distressing paint with a sander it means I have a large piece to distress and I want to remove a lot of paint. I use the sander for moderate and heavy distressing. 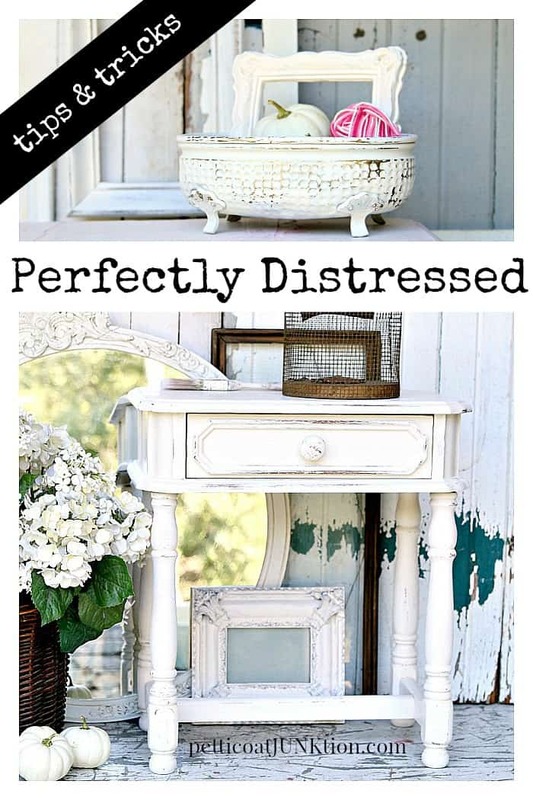 Now to answer some of the issues I just mentioned about distressing painted furniture. I talked about wood furniture being the only good candidate for distressing. An alternative to distressing is a technique using a layering block. The layering block is used to apply a thin line of contrasting paint over the painted piece to give a two-toned finish. To see this technique click here….Layering Block Distressing Technique. For paint that is hard to remove I dampen it with a wet rag and sometimes spray the piece with Simple Green. It all depends on how hard it is to distress the paint. After wiping the paint with a damp rag let it sit for a few minutes then distress with sandpaper. Sometimes sanding will leave a hazy look on the paint. Applying a layer of thin wax should cover that up. Also if the wood has a raw look to it the wax will darken the wood a bit and give it a more natural look. My favorite budget wax is Howard’s. 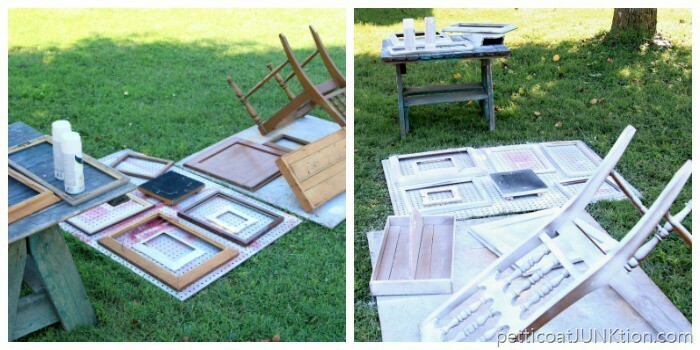 The frames and other accessories in this post were painted with spray paint. I like to save time and paint small projects in bulk. Call me crazy. I shared some of the projects last week. I also made a short video showing how I distressed the frames and other pieces. The question last week that I forgot to answer was about the amount of spray paint I used for all of those pieces. I used less than two cans! The side table/nightstand is an earlier project I painted and distressed with Vaseline. It is the palest pink. The brass bowl is especially pretty distressed. It had all those little bumps ( hammered details?) that distressed really nicely. Any highly detailed piece is perfect for distressing! Do you guys have any tips for me on distressing painted furniture or the products you prefer? Please share! As I mentioned, these are tips I’ve picked up over the years, I still have a lot to learn. 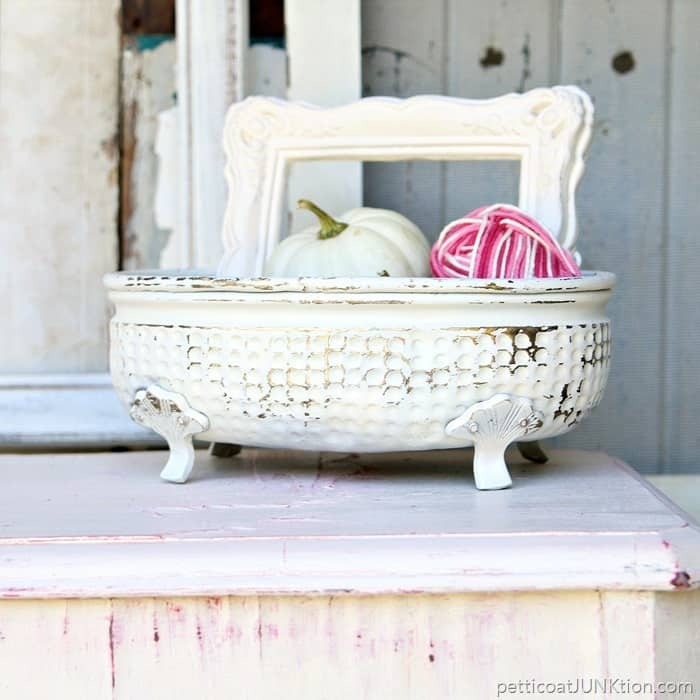 There is a list of tools and products I like to use for distressed paint projects at the end of the post. Kathy thanks for all the tips. I am soaking them up like a sponge. Love love that copper pot! i need one now! Thanks for linking up to Merry Monday! Sharing on G+! Have a great week! Thank you Kathy. These tips were very helpful for me. I am relatively new at serious furniture painting. I have had success with small pieces. I have a bigger undertaking; a wall unit on my agenda and I will employ these techniques. Again, you inspire as well as instruct and you are appreciated. Kathy, I really like all your painting and distressing hints. It’s very helpful and saves us time. You make it look so easy. Thanks to you, (I mentioned to my son that I was watching you use a tent while painting) and in two days , I got a nice surprise in the mail…..a Home Right, spray paint shelter. 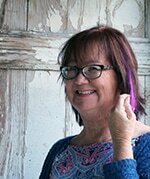 I’m waiting for it to get cooler in FL, so I can get outside and paint. Haha, that’s funny. It is hot in Florida. Glad you got the spray shelter! I love the way you make all your items look. hoping to start out small with a picture frame, distress , put handles on it and use a tray. Can’t wait to do this , then on to bigger items.